When England led West Germany 2-0 in the World Cup quarter-finals in 1970, they harbored serious aspirations of retaining the trophy and with it qualifying automatically for the 1974 finals. Then came the painful collapse, England losing 3-2. 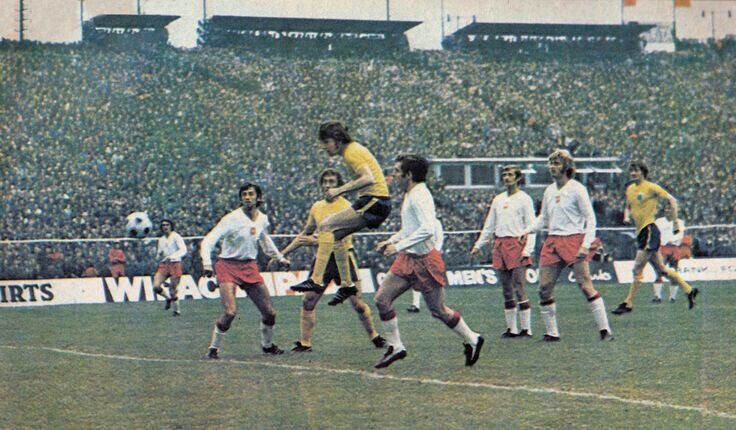 It marked the start of a miserable decline, the West Germans beating England with conviction during the quarter-finals of the 1972 European Championship. Sir Alf Ramsey remained in charge but each tournament seemed to be representing a step back, while his celebrated Boys of ’66 were increasingly dwindling in number. By the start of the 1972-73 season, only Alan Ball, Gordon Banks, Bobby Moore and Martin Peters were still seriously in Ramsey’s plans from the side who played on July 30, 1966, with Geoff Hurst the latest to leave the international stage. After featuring automatically as hosts in 1966 and holders in 1970, England would now have to emerge through qualifying to make it to the 1974 World Cup in West Germany. They were placed in a three-cornered group with Poland and Wales, with only the winner progressing. The anticipated outcome was that would be England, with a 3-0 victory away to Wales in the Home Internationals in May 1972 offering a psychological boost. But a home defeat by Northern Ireland in the same competition represented another poor result and a growing sense that the side now struggled when playing at Wembley. Meanwhile, Poland would send out a warning of their capabilities by winning the Olympic football title in Munich later in the summer. They were hoping to qualify for their first World Cup since before the Second World War. But both before and after the draw was made, the prospect of England not making the finals seemed to enter few heads – on English soil at least. When the side returned home from the 1970 World Cup, a banner was displayed wishing them better luck in ’74; emerging players would regularly be discussed as potential members of the 1974 England World Cup squad without the phrase “provided they qualify” being uttered; and even BBC commentator Barry Davies, an admirer of the Poles, went so far as to say following their Olympic triumph that he believed they could have gone on to do well in the 1974 World Cup had they not been handed a qualifying group including England. In other words, it seemed almost taken as read that England would reach West Germany – the bigger question was how far they would get once there. 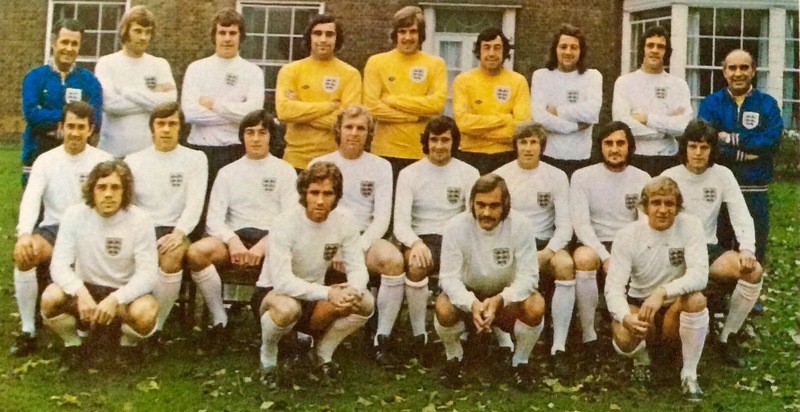 The England squad for the friendly against Yugoslavia in October 1972, just days before Gordon Banks was involved in a career-ending car crash. England’s first game of the 1972-73 season was a 1-1 friendly draw with Yugoslavia at Wembley in October, with Ramsey experimenting as he handed four players their debuts and Joe Royle found the net during only his second cap. But Ramsey was dealt a major blow later in the month. “Of all the players to lose it had to be him,” he had said when Banks was ruled out of the 1970 World Cup quarter-final against West Germany. Now he was left to plan without him permanently after his star goalkeeper was involved in a car crash that ended his professional career and cost him his sight in one eye. While there was younger talent emerging such as Ray Clemence and Peter Shilton, the latter having played against Yugoslavia, the experience and expertise Banks possessed would be greatly missed. Only a few months earlier he had played a key role as Stoke City won the League Cup. In November, England made the short trip to Cardiff for their opening World Cup qualifier away to Wales. Ramsey looked to Liverpool for new blood in the side, as Clemence and Kevin Keegan were handed their debuts and began their long international careers. Colin Bell’s goal separated the sides and gave England a winning start in the group. It was not a particularly vintage display but Ramsey’s 100th match as manager had been marked with the desired victory. Few would have envisaged it being the only England victory during the qualifying group. The first real warning sign of what lay ahead came during the return game against Wales at Wembley in January. It was the first World Cup match of any description played beneath the Twin Towers since the 1966 final, with England having the same manager and captain as that famous day. But there were few other comparisons, other than Ramsey’s men conceding the opening goal as John Toshack scored. They drew level in style through Norman Hunter before the break, as he fired a tremendous drive out the reach of Leeds United colleague Gary Sprake. “Oh, how England need forwards who can shoot like that,” wrote Geoffrey Green in The Times. 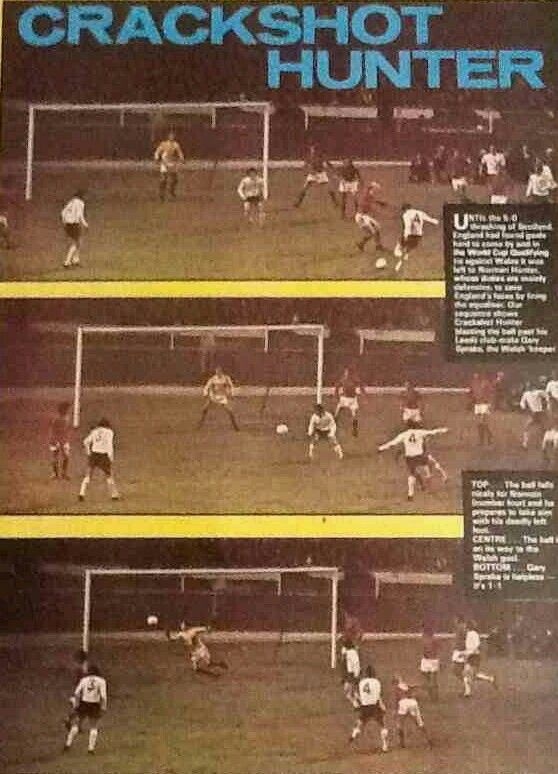 Norman Hunter’s goal against Wales was a rare highlight of England’s qualifying campaign. In an ominous precursor of the other Wembley match during this qualifying campaign, England created chances but failed to take them and they came across a goalkeeper who had his critics but would make key saves to deny Ramsey’s men. The game ended 1-1 and it was the last international action for Rodney Marsh, whose relationship with Ramsey would never be an easy one – characterised by the awkwardness when Marsh made a joke in response to a threat by Ramsey to “pull you off” if he failed to perform. Marsh was one of several Maverick players in the era who found their England outings limited. The dropped point against Wales was disappointing but matters were still in English hands and confidence was restored with a tremendous 5-0 away win over Scotland in a friendly on Valentine’s Day as Moore on his 100th cap. Mike Channon was one of the most notable recent additions to the squad and he scored his first international goal in only his second cap. The win improved the mood in the English camp as the squad prepared for a three-month break from international action before a hectic period of games in May and June. But it would not be the last instance during the year of England delivering in a friendly – albeit against their old rivals – and not doing so in games with World Cup qualifying points at stake. While England rested, Wales faced Poland in March and goals from Leighton James and Trevor Hockey gave the Dragons a 2-0 win to bring them level with England. But Wales only had one game left, England had two and it seemed unlikely the 1966 winners would miss the boat to West Germany. Poland would realistically have to win their home qualifiers against England and Wales and then avoid defeat away to the English to top the group. It looked a tall order and there seemed little reason for Englishmen to panic – except those who really knew how much of a threat the Poles were. The Home Internationals gave cause for hope as England won all three games – their first victories on English soil for two years! Martin Chivers scored twice in an ‘away’ win against Northern Ireland at Goodison Park, before there was a sense of what might have been four months earlier as England defeated Wales 3-0 at Wembley. Ramsey was still looking at his goalkeeping options following the loss of Banks, with Shilton doing his chances of being the regular number one no harm with a tremendous save from Kenny Dalglish in the Wembley win over Scotland. The games were followed up by a friendly away to Czechoslovakia, in which Allan Clarke netted a late equaliser to keep England unbeaten so far in 1972-73. But the game that mattered most was the one away to Poland in Chorzow on June 6. An England victory would leave them on the brink of qualifying for the World Cup and a draw would also see them retain the advantage. But if they lost then serious concerns would start to creep in about England’s prospects. Ramsey certainly seemed to make clear his big concern was avoiding defeat when he left Channon out of the side and picked the defensive Peter Storey in midfield. “He wrote it in letters 10 feet tall that England had come here for a draw,” wrote an unimpressed Green. Ramsey’s wingless approach has paid dividends in 1966 but critics of the system had lingered, becoming more visible as the side went into decline. “A state of mind that often gets what it deserves,” was Green’s damning assessment as he and 105,000 others saw the yellow-shirted English beaten 2-0. It was England’s first ever World Cup qualifying defeat and it came when they could least afford to slip up. England’s qualifying hopes took a major hit with defeat in Poland. July 30, 1966, saw Ramsey steer England to World Cup glory, Moore gloriously captain the side, Ball turn in what many considered a man of the match display and Peters get on the scoresheet. On June 6, 1973, each man had a day to forget and it would symbolise the end of an era. Ramsey would take criticism for England’s defeat, Peters missed a great opportunity to equalise and Ball became only the second player ever to be sent-off playing for England after a scuffle saw him lash out. But for Moore it was the biggest nadir. For so many years he had been the immaculate and ultra-composed star of the side. But not here. The first Polish goal was a free-kick by Robert Godocha that appeared to catch Moore on the way in; the second in the infancy of the second period saw Moore given the sort of ball he had successfully dealt with hundreds of times. But as he prepared to bring it clear he was dispossessed by Wlodzimirez Lubanksi, who charged through and shot confidently past Shilton. It was the killer goal and Ramsey – chastised for making substitutions prematurely in the 1970 World Cup against West Germany – would now be seen as too hesitant as he kept attacking options on the bench that could have freshened things up. Moore would never feature in another competitive international, Ramsey opting against fielding him in the home game against the Poles. He did though captain the side in three further friendlies, two of which followed the defeat in Poland as England won 2-1 away to the USSR and lost 2-0 in Italy to bring the season to a close. Ultimately the loss to Poland mattered far more than the other games on the tour and England now faced an anxious wait for the return match in October. England next convened for action on September 26, the day of a vital clash between Poland and Wales in the qualifying group. A draw would be the result to best suit England, but Poland enjoyed a 3-0 success to end Welsh hopes and move top of the group. England knew they would have to beat the Poles and they boosted confidence that they could get that result by thrashing Austria 7-0 in a Wembley friendly with Channon and Clarke both scoring twice. If England could show anything like this level of potency against Poland then they would qualify. “This October match is the thundercloud hanging over the new season. Failure would bring the sort of cataclysm not seen since Ramsey’s last match as an international right-back, the 6-3 slaughter by Hungary 20 years ago,” wrote Mike Langley in the Sunday People. The prospect of failure was both unthinkable and a real one at the same time. 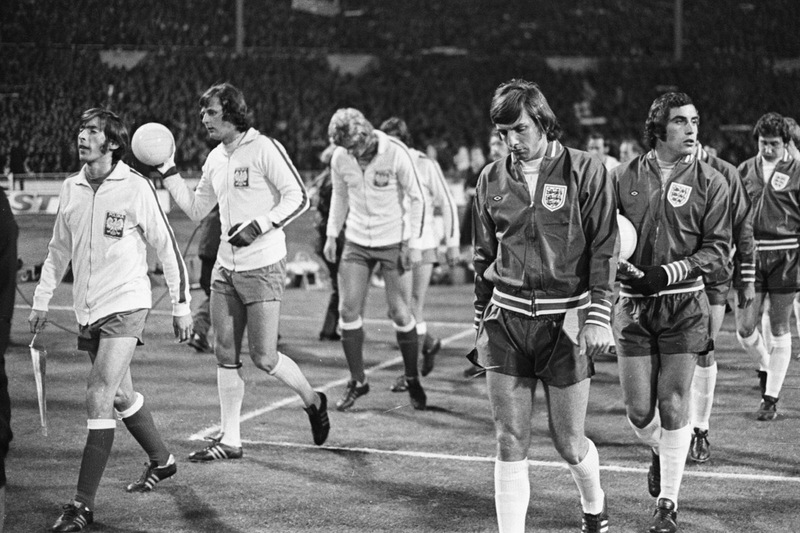 England and Poland enter the field at Wembley, with Jan Tomaszewski (second left) about to have the night of his life. Ramsey kept the same side that had thrashed Austria three weeks earlier. The Poland game was of such significance that Wembley was packed to capacity, ITV were showing it live and the BBC would broadcast highlights afterwards. “Win or bust” said Davies as he began his commentary for the latter. It was indeed a simple scenario. An English win would take them through, anything else would be enough for the Poles. There would be no play-offs or qualifying spots for second place sides. It was do-or-die for England. David Lacey wrote in The Guardian: “On form and ability, England should win comfortably. The main doubts will concern the ability of the front three, Channon, Chivers and Clarke, to snap up the fleeting chances that come their way.” His words would prove prophetic. The events of the night have passed into infamy. ITV pundit Brian Clough called Jan Tomaszewski a “clown”, but the Polish goalkeeper had an inspired evening; England created chance after chance but couldn’t break the deadlock; then early in the second half the Poles broke away and took the lead through Jan Domarski, with Hunter and Shilton never allowed to forget the errors they made during the process; England finally did find the net when Clarke scored from the spot and the pattern resumed of the Poles clinging on as the home side pressed; Ramsey seemed reluctant to make a change as time ticked away, insisting later that his watch had stopped; and when a substitution was at last made as England brought on Kevin Hector in the closing moments it so nearly paid off, as he came close to scoring a winner. Despair for Norman Hunter after England’s World Cup exit. But the Poles clung on and celebrated with understandable delight as the final whistle blew. At the same time thousands of England fans at Wembley and millions watching on television were feeling stunned. “It’s over. It’s all over,” uttered ITV commentator Hugh Johns. It was probably not an intentional play on words concerning Kenneth Wolstenholme’s famous line from 1966, but it would seem symbolic. That had been the most joyous moment; this was the most painful. For Ramsey it must have evoked painful memories of the infamous games against the USA and Hungary during his playing career for the sense of disbelief over what had happened. He remained dignified amid his inner anguish, congratulating counterpart Kazimierz Gorski. 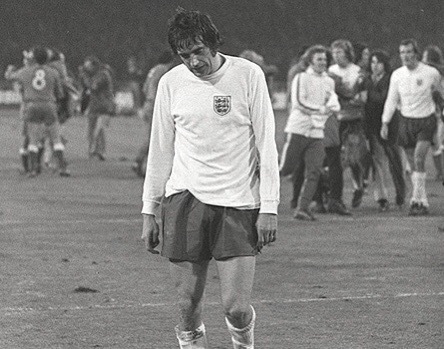 Even in 1973, the cost of England’s failure could be measured financially. It was reported that England players had stood to earn as much as £30,000 if the side enjoyed success in the finals. Meanwhile, FIFA president Sir Stanley Rous said: “As disappointed as anyone will be West Germany. They had relied on England’s presence for both sporting and financial reasons.” Travel agents, TV companies and the Football Association were all reported to be missing out on financial windfalls due to the side’s absence. Scotland would instead represent Britain at the finals, as Englishmen were left looking on the following summer and wondering how such a poor side as Zaire could be there when they weren’t. But that’s the way it worked and England had to live with their failure. On one hand they had been unlucky. They had landed a joker in the pack in Poland, whose side were stronger than most England could have faced. They had seen their luck out in front of goal against the Poles, on a night when they had created far more chances and it seemed the ball just didn’t want to go in. And the loss of Banks had been felt, intensified by Shilton’s error against Poland. But there were also arguments that England had little cause for complaint. 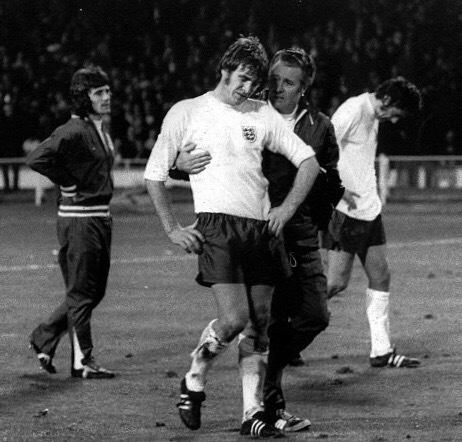 Although most of the luck was against them against the Poles, the penalty they were awarded to level the scores was considered dubious and Roy McFarland was fortunate to stay on the pitch after effectively rugby tackling Grzegorz Lato; they had failed to win either home fixture and triumphed in just one match out of four; while most would believe England should have won the home game against Poland, not so many went along with Ramsey’s assertion that they were the better side in the away fixture. And the Poles had ultimately delivered in their home matches in a way the English had not. Emlyn Hughes is left stunned by England’s exit. For Ramsey it was a sad end to an era that had previously brought the ultimate joy. His qualifying failure gave ammunition to critics. Green called for England to revert to using orthodox wingers and wrote of Ramsey in The Times: “He has allowed England’s football to fall into a grey, predictable groove.” Questions would be posed surrounding Ramsey’s future and he gave no indication he was going to walk away. “I’ve got to work to live,” he told a young John Motson afterwards. Ramsey felt pride about the performance he had seen, while being shattered by the outcome. But he was magnanimous about the Poles and Tomaszewski. “His performance was equal to that of any foreign goalkeeper we’ve had at Wembley in my time as England team manager,” he said, being far more gracious towards Tomaszewski than Clough – who was confusing to lay into him and declaring him the weak link in the Polish side. The World Cup catastrophe failed to deter 88,000 fans from showing up at Wembley the following month for a friendly against Italy. But there would be further disappointment as a Fabio Capello goal gave the Italians victory. Ramsey was still at the helm the following April, when he showed signs of planning for the future by handing out several new caps for a 0-0 friendly draw with Portugal. But within weeks the axe would fall. To some it was a justifiable action by the FA, given Ramsey had failed to achieve World Cup qualification and was not willing to walk away; to others it was an outrageous decision that a man who had won the World Cup with England should end his reign with the indignity of being sacked. It was a messy divorce, with future FA chairman Sir Harold Thompson believed to have played a prominent role in the dismissal. Ramsey was left to spend his summer working for ITV during the World Cup, as the English nation watched on and wondered what might have been. In some respects Hardaker was right. The domestic programme would soon enough be top of the footballing agenda. But for the most part he was wrong. It wasn’t forgotten within a few weeks. It would be remembered for years to come and is still discussed now. Had England achieved a routine win then it would probably barely get mentioned; but ultimately they didn’t. And things would arguably get even worse, England being absentees from both the 1976 European Championship finals and 1978 World Cup. The Poland game would come to symbolise England slipping into the footballing wilderness and being unable to find their way out of it. And what of Poland? They headed off to West Germany and proved they were worthy of being in the finals, finishing in third place and impressively winning six games out of seven. They may have clung on desperately at Wembley, but their breakaway goal showed the threat they could pose and they boasted a good collection of players – even though the talented Lubanksi was out with an injury sustained in the home game against England, whose failure could be put into some perspective by Poland’s success in the finals. But it was still a hard pill to stomach for the nation, an experience that is still recalled with great frequency 44 years later.